This part isn’t mentioned in the Bible per say, such as the rapture, or the trinity, but the Bible infers these things without actually saying it. What is the unworthy manner? Well just to recap what baptism is; you are putting away the old sinful life, and starting a new one in Christ, in holiness, in obedience. If you have not yet been baptized you need to take that all important first step of obedience towards Christ. Christ makes a very clear command to all who believe and that is to be baptized; Mark 16:16. In baptism you are making a commitment to Christ to live for Christ. If you have not yet made that commitment or aren’t yet serious about it, do not participate in the Lord’s Supper. Don’t Baptize a baby or an infant! This is not Biblical. Nowhere in the Bible has God commanded us to baptize babies. 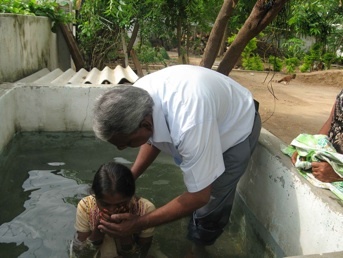 Baptism is a conscious decision made by the person being baptized. Although this tradition has been practiced by Catholics for hundreds of years this seemingly good ceremony is not valid. Many of us have been baptized as an infant and we have god fathers, and god mothers. But we must all make a decision in our lives to follow Jesus Christ. Jesus commands us to be baptized. Can a baby make that choice or confess Jesus is Lord? Certainly not. Baptism is the next step after receiving Christ into your life. Once you’ve decided to sincerely follow Christ as your Lord and Savior you next step of obedience is to be baptized. The Bible offers several instances where people were baptized immediately after making this important decision. Here are two. 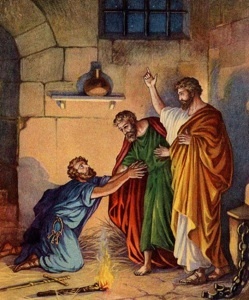 Paul, Silas and the Philippian Jailer. In order to be baptized, one must first hear the word, then believe in your heart, and confess with your mouth that Jesus is Lord, risen from the dead. Can a baby do that? 13Then cometh Jesus from Galilee to Jordan unto John, to be baptized of him. 14But John forbad him, saying, I have need to be baptized of thee, and comest thou to me? 15And Jesus answering said unto him, Suffer it to be so now: for thus it becometh us to fulfil all righteousness. Then he suffered him. 17And lo a voice from heaven, saying, This is my beloved Son, in whom I am well pleased. 47Can any man forbid water, that these should not be baptized, which have received the Holy Ghost as well as we? 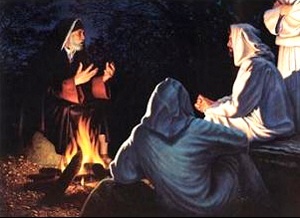 48And he commanded them to be baptized in the name of the Lord. Then prayed they him to tarry certain days. 17So then faith cometh by hearing, and hearing by the word of God. 4Then said Paul, John verily baptized with the baptism of repentance, saying unto the people, that they should believe on him which should come after him, that is, on Christ Jesus. 5When they heard this, they were baptized in the name of the Lord Jesus. 6And when Paul had laid his hands upon them, the Holy Ghost came on them; and they spake with tongues, and prophesied. 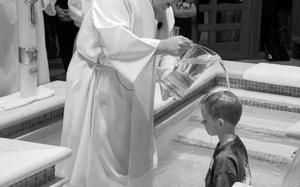 Baptism is the only act done in the Name of the Father, and of the Son, and of the Holy Ghost. Baptism doesn’t wash away sin. Salvation is a gift of grace through faith; Eph 2:8-9. The minimum requirement for salvation is your humble repentance, calling out to God in Jesus name in faith, this is true belief. God is the righteous Judge; Ecc 3:17, 1 Pet 2:23. He knows if someone was not able to be baptized after believing in heart. They might of had difficult circumstances. God’s long-suffering gives people up until their last dying moment to repent and ask for His forgiveness; Psalm 86:15, 2 Pet 3:9. One great example of this is the criminal on the cross. Baptism is a command from God. Many so-called pastors are using the criminal on the cross as a doctrine for not needing to be baptized. 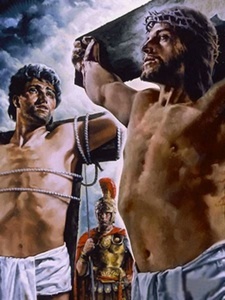 The criminal had his hands nailed to the cross. He wasn’t able to do any works. He did however do something internally. He repented, and received Jesus in his contrite heart; Prov 28:13-14. In his heart he believed, and with his mouth he defended Jesus, and called out to Him. How long should I wait to be baptized? The criminal on the cross was an example of last minute repentance. See; Last shall be first: Matt 20:1-16. But this is not the same case for those who do not have their hands tied down. 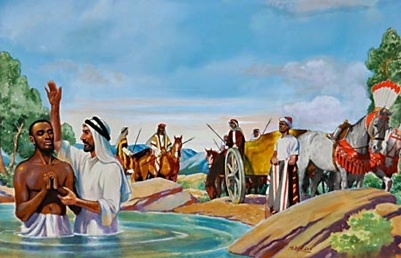 The command has been given by Jesus after the resurrection and that is to be baptized. Who dares to argue and deny the Lord’s commands? God commands that we be baptized. Show God you love in Him by your obedience. Many churches today hardly mention baptism or put it off for later. They do not base their church off being baptized but the focus point is a wonderful worship service, thinking this is what pleases the Lord. Some churches have a perfectly good baptismal pool just sitting there unused. This is upsetting when you consider how many people want to be baptized and some churches put you on a bit of a run-around to be baptized. I’m on the verge of taking a friend to the local pool, and baptizing him there. I don’t know what church to send him to that will baptize him immediately without delay? These churches aren’t promoting the true gospel these days of obedience to the Lord by his established word, so people put it off for later. These churches are subject to modern traditions instead. Also they send out an incomplete message of believing in Jesus alone is what’s needed for salvation, again leading people astray from obeying the Lord. Jesus gave the command to be baptized, and today’s so-called pastors are antagonizing his commands by saying you don’t need to be baptized. Think about that for a second. Who do we serve and follow? If you said Jesus then listen to Jesus and do what he says. Salvation is FREE. Baptism comes after you accept Jesus as your Lord and Savior. Baptism is FREE. The message of the gospel is FREE. Ask around the churches and find a Bible-based Christian church. Find a pastor or minister who will baptize you without delay. It’s simple and free. Confess Jesus as your Lord and Savior, be baptized in the name of the Father, the Son, and the Holy Ghost, and begin your new life in Christ in sainthood. If you’ve already been baptized, live the clean and blameless life of a saint; Eph 5:2-4, Phil 2:15, Rev 3:4-5. Another reason for you to be baptized is that without it you should not participate in the next commandment of Jesus, The Lord’s Supper. The Lord’s Supper is only for serious (Luke 9:59-62, John 6:60-64) born again believers and followers of Christ. This part is has some discussion. Some say to do it in the name of Jesus because in Acts they did it in the name of Jesus. I believe God works in 3 ways; the Father, the Son and the Holy Ghost, and all three are One and the same God. People love to make up new doctrines out of one verse or misunderstandings. I personally believe there’s nothing wrong with confessing the three persons of God in baptism, and yes, God has given us One name where by we must be saved and that name is Jesus. 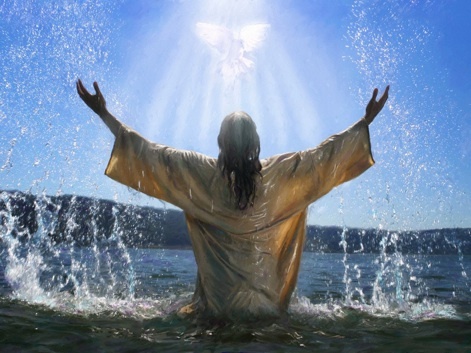 Just to be safe, let us acknowledge the 3 persons of God in Baptism as commanded by Jesus. Jesus says do it that way, who are we to argue? I was brought up in a Baptist church, and when I was baptized I confessed Jesus as my Lord and Savior, and was baptized in the name of the Father, and of the Son, and of the Holy Ghost. When in doubt we can trust Matt 28:19 as the official command of the Lord. Baptism is by immersion into the water. βαπτ‑ισμός, ὁ, dipping in water, immersion. Baptism literally means immersion. 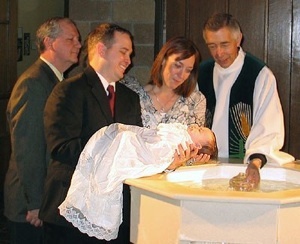 Many depictions of baptism show a sprinkling of water over the head. These are incorrect. True baptism is by full immersion into the water representing our death of the old life as we die in Christ and emerging or resurrecting into a new one in Christ. Symbolic of the death and resurrection of Christ. 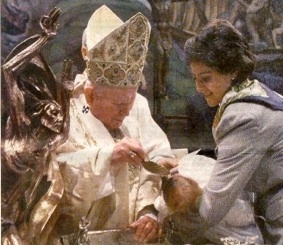 Baby baptism is incorrect and unbiblical, also pouring water over a persons head is incorrect. Baptism is by immersion. 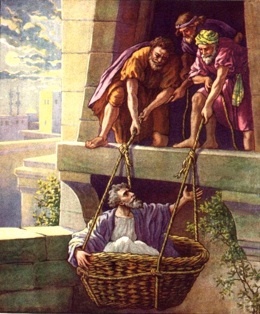 18And immediately there fell from his eyes as it had been scales: and he received sight forthwith, and arose, and was baptized. 19And when he had received meat, he was strengthened. 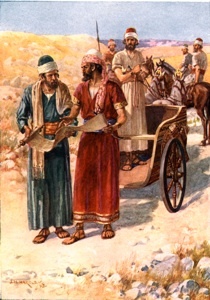 Then was Saul certain days with the disciples which were at Damascus. 20And straightway he preached Christ in the synagogues, that he is the Son of God. 21But all that heard him were amazed, and said; Is not this he that destroyed them which called on this name in Jerusalem, and came hither for that intent, that he might bring them bound unto the chief priests? 22But Saul increased the more in strength, and confounded the Jews which dwelt at Damascus, proving that this is very Christ. Getting Baptized isn't that easy. You kinda sorta need to put forth some effort. But all day we see people put forth some effort into other things thinking that will bring them life and happiness. For example people will go to great lengths to find a costume for Halloween. They had an idea and they looked everywhere until they found what it is they were looking for and when the day came they got all dressed up and had a blast on Halloween. They have their heart set on Halloween. With that said where is that faith in Christ to go and do what the Lord asks? Sure finding a good Christian church who will baptize you can be difficult. They might even put you on a waiting list which they shouldn't. But fine, you are on a waiting list and your heart does not faint. That's true faith, when your heart belongs to the Lord and you keep all his commands. Looking at the rest of the world they keep all the traditions of man and they obey every single holiday and every fleshly lust, kinda lets say tattoos. Everyone is getting one. Now your heart is set on getting one too. You go and you pay top dollar to sit in a chair and have an artist defile your skin with a needle gun for 3 painful hours. Now you have to let it heal for a while but soon after you'll be able to show off your body art to the rest of the world and be just like them. But the things of the Lord, are they not 1st priority? That's not true faith. You can say you believe in God but in heart you really don't. Baptism itself does not save, but if you are saved you will go get Baptized and endure (stay that way) until the end. Romans 6:23 sounds very different when read in context. Romans 6 is not about simply believing and that’s it, like some are leading you to believe, but obeying the Lord in righteousness. Paul explains the true significance of Baptism is symbolic of the death and resurrection of Jesus Christ. Death unto the past sinful life, and a newness of life in righteousness onto God through Jesus Christ our Lord.